Consumers use lots of data on their mobile devices. While half of consumers use less than 7 GB per month, data consumption is heavily skewed toward the upper end, recent Parks Associates research indicates. Among U.S. broadband households, mean data consumption is roughly 20 GB per month, with 14 GB used on WiFi and 6 GB through 3G/4G/LTE networks. Consumers’ monthly WiFi data consumption increased by 40 percent from 2015 to 2016. While data use overall has been increasing, WiFi use has been increasing faster than mobile data. The use of WiFi is strongly correlated with the use of 4G/LTE data. As use of one increases, so does use of the other. 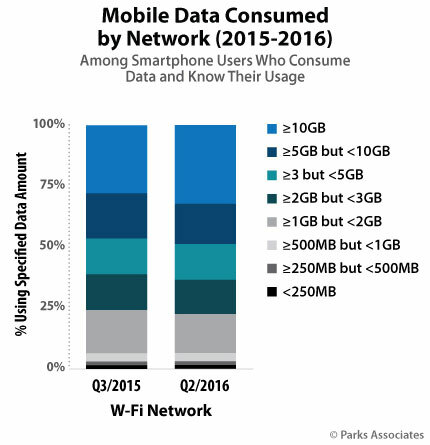 Even unlimited data plan holders use WiFi; one-quarter of them use more than 15 GB of WiFi data per month, based on Parks’ findings. This implies that there is a «data hungry» type of mobile user comprised of those who want to consume video content and other data-hungry services and are not particular about the kind of data they use. In the U.S., about 75 percent of broadband households use a home WiFi network, which equals 76 million home WiFi access points. Consumers can make their WiFi Internet connections in a number of ways — through DSL or fiber-optic broadband from a telephone company, cable high-speed Internet from a cable provider, satellite Internet from a satellite provider, or, increasingly, through WiFi hotspots powered by a device accessing a 3G/4G mobile network. In addition to these more established WiFi solutions, fixed wireless broadband is beginning to emerge as a viable and robust technology. Fixed wireless broadband traditionally has offered last-mile service over a wireless connection using high-frequency radio signals. The older technology typically was limited to 10 Mbps of network bandwidth, required line-of-sight access between the subscriber and a ground station, and suffered from attenuation during the rain and fog. However, newer experiments in the mmWave band, done in anticipation of 5G, have solved these issues to a large extent, allowing fixed wireless broadband to expand beyond its traditional offering. Starry, a wireless startup, can deliver Gigabit-class Internet to the home over a distance of 1KM to 1.5 KM using mmWave technology in the 39-GHz band. Both Verizon and AT&T plan to launch a precommercial 5G network for fixed wireless service using mmWave spectrum later this year. This hybrid model is made possible by the latest WiFi hotspot standards, which partition the WiFi channels into public and private use. Through this kind of technology, public WiFi hotspot numbers are increased dramatically in these countries, a benefit appreciated by wholesale and retail customers. The U.S. market may not be well suited for this WiFi use case, because public WiFi hotspots in U.S. residential areas don’t attract many users. Comcast most recently launched its long-anticipated Xfinity mobile service, highlighting its WiFi footprint of 16 million access points. This figure appears to include its home hotspots in the residential area. Time will tell how such home hotspots are being used, and whether such use can translate into meaningful subscriber gain for Comcast or other cable multiple system operators with similar WiFi assets. Consumers’ appetite for mobile data will continue to increase at a faster speed, no matter the location, based on Parks’ research. Monthly consumption of mobile data will top 49 exabytes, up from 7.2 exabytes recorded in December 2016, according to Cisco. While mobile networks will be upgraded by then, this data tsunami nevertheless will pressure-test a mobile network’s limits, and offloading solutions like WiFi are expected to play an important role in mobile operators’ network densification strategy.